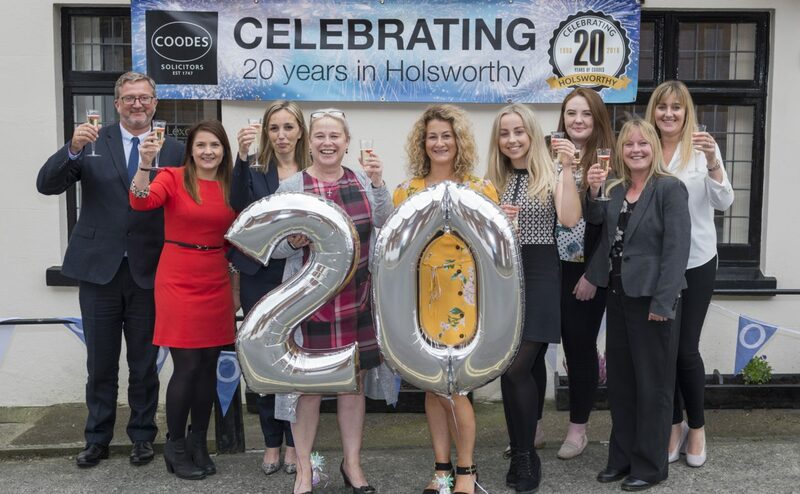 Coodes Solicitors is celebrating its 20th anniversary in Holsworthy. Clients, suppliers and representatives from local businesses joined partners and staff for a party at Coodes’ office at the heart of the town on Friday 28th September. Guests enjoyed a barbecue in Coodes’ courtyard garden and a 20th anniversary cake to mark the firm’s two decades in the town. With a network of offices across Cornwall, Coodes Solicitors opened its Holsworthy office in 1998. Partner Pam Johns, a commercial property lawyer and agriculture specialist born and bred in Holsworthy, spearheaded the expansion into North Devon. Pam spotted the opportunity in her home town while working at Coodes’ Launceston office. After outgrowing its original premises, the firm moved to its current location on Bodmin Street in 2001. With eight full time members of staff, the Holsworthy office employs a number of people from the local area. Many have developed their legal careers and some have qualified as solicitors while working for Coodes. The Holsworthy team has a particularly strong residential and commercial property team, as well as providing expert advice on corporate and commercial law, family law and wills, trusts and probate. Every Wednesday, Pam Johns and other members of the team meet with local farming clients at Coodes’ kiosk at Holsworthy Livestock Market. The firm is also a regular at Holsworthy and Stratton Agricultural Show. Over the last 20 years, the firm has supported a number of community initiatives and local charities, including the Annual Holsworthy St Peter’s Fair Week. Coodes is a sponsor for Holsworthy Town Council’s event Holsworthy World War One 100 years – to the Memory of the Fallen and the Future of the Living. Coodes Solicitors Partner Pam Johns said: “Over the last 20 years, Coodes has remained committed to Holsworthy and surrounding area. As well as developing strong links with many local businesses, we work closely with the local farming community and have established a specialist agricultural law team to support them. “Having grown up in Holsworthy and lived here all my life, I am really proud of being a good employer in the town, nurturing local talent. From the beginning, it has also been important to me that Coodes plays an active role in the community. That’s why we have always worked hard to ensure we’re at Holsworthy Livestock Market each week and that we support local initiatives.